Phil Dillingham has had a long successful career as an aviator for the military and as a pilot for United Airlines (formerly Continental). He grew up in a loving family where his mother was an educator and his father was a military veteran. Because of his success in athletics, he was recruited to and attended the United States Air Force Academy. After making through the Academy, he became a pilot in the Air Force flying “heavies” including the C-130 and the C-17. 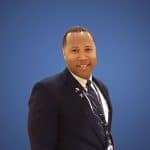 With a wife who was successful in her career, he decided to finish his time in the military in the reserves and has done so with distinction at Travis Air Force Base while also flying as a pilot for United Airlines. As a long haul pilot, he works 3 days on and 5 to 7 days off. During those days off, he runs a business commercializing new and interesting technology with a Shark Tank style approach to evaluating, building, investing in and selling businesses. He also is a motivational speaker talking to young people and groups of all ages around the country. It’s a great opportunity to see how his push for you to listen and have discipline can lead to you being a success in whatever you do as long as you also ask for help when you need it.